The Washingtonian.com program is available to partners at an investment level of $4,500 per partner. Visit North Carolina is excited to introduce a local digital program offering through Washingtonian.com to promote partner destinations in the D.C. market and surrounding Maryland and Virginia suburbs. Washingtonian is the savvy, sophisticated lifestyle magazine and digital publisher that explores travel, food, culture, wellness, parenting, politics and more. Founded in 1965, Washingtonian has set the pace for anyone who wants to be a local – or just navigate the city like one – in a region that draws many newcomers. 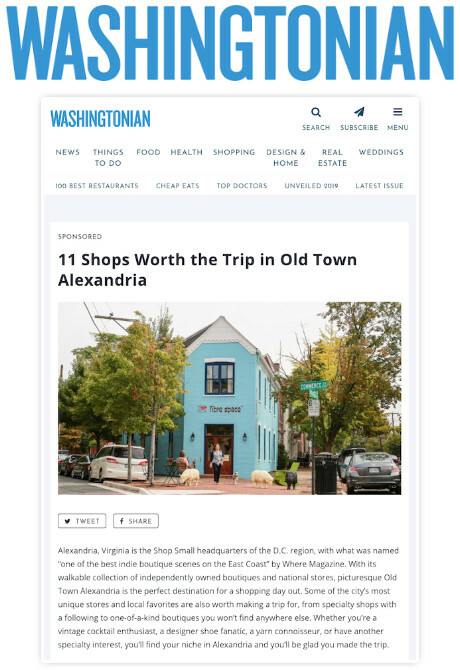 This partnership allows for custom content development by the Washingtonian.com editorial team with article support and promotional exposure via organic and paid social media amplification. The AJC.com program is available to partners at an investment level of $5,500 per partner. Visit North Carolina is excited to introduce a partnership with AJC.com as an outlet for partners seeking exposure in the Atlanta market. As the digital arm of Atlanta Journal- Constitution, the only major daily newspaper in the Atlanta metro, AJC.com is the dominant resource for local breaking news, sports, entertainment, things to do and much more. Promote your destination through a sponsored article developed by AJC.com’s editorial team and supported by organic social media and on-site distribution. The 6AM City program is available to partners at an investment level of $1,750 per partner. New this year, Visit NC is teaming up with 6AM City to offer the first multimarket digital opportunity, allowing participating partners to create custom article content and distribute it in your choice of one of six Southeastern cities; plus, an incremental yet convenient option to cross-promote the sponsored content in multiple markets. NCBeerGuys.com Display Advertising is available in 3-month flights for $375 per flight. For the first time, partners will have the opportunity to place beer-related display ad banners on NCBeerGuys.com. 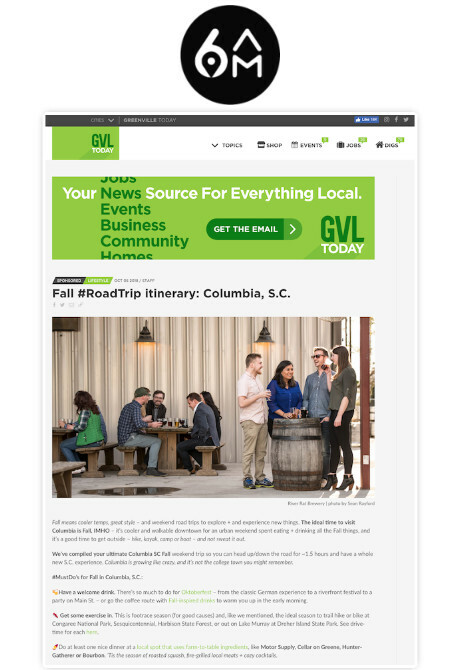 Participating partners will have their ads featured on the Events page of the site as an awareness driver to help promote your local beer scene. 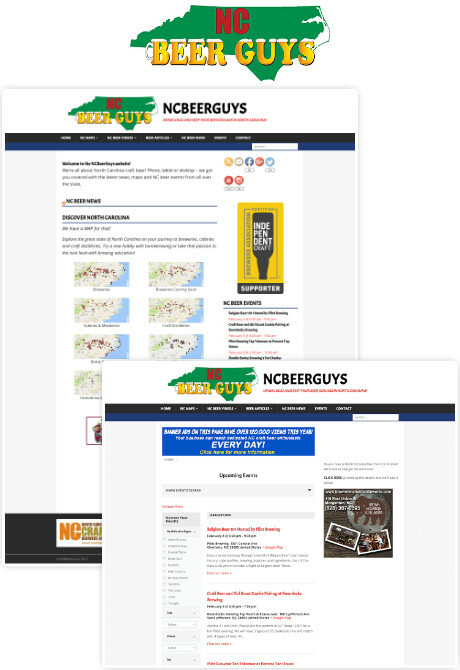 NCBeerGuys.com is a top result in many searches for North Carolina beer events, festivals and information. The site’s Events page lists several hundred beer events throughout the state and is also used as the events database for NCBeerMonth.com. Material Requirements: you will be required to submit fully furnished beer-related display ads of multiple sizes as well as a downstream URL. 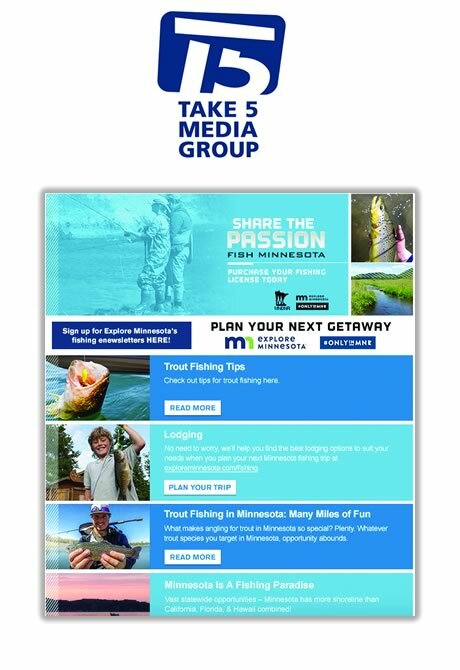 Take 5 Media Group sources, owns and operates its own organic and proprietary U.S. domestic consumer database, feeding a unique mix of prospecting and retention solutions across various online channels (e.g., email, display, social media) and offline channels (e.g., direct mail). Strict data-sourcing guidelines ensure clean, compliant data, that drives intelligent and effective multitouch campaigns. Take 5’s expertise in data and email marketing lets you reach highly targeted, qualified consumers with in-market travel intent. Other audience selects will be overlaid based on partner needs to further refine campaign reach (e.g., family vacationers, history buffs, golf enthusiasts, retirees). Each program option is performance-driven and designed with frequency in mind in order to re-engage audiences and build on messaging. The AtlasObscura.com program is available to partners at an investment level of $2,500 per partner. Atlas Obscura is the definitive travel guide to the world’s hidden places. With a mission to help people escape the ordinary and experience a sense of wonder and curiosity, Atlas Obscura believes there is something new to discover every day – whether it’s halfway around the globe or just around the corner. This co-op offers the opportunity to work with Atlas Obscura’s editorial team to curate and add a new Atlas Obscura Place or Gastro Obscura Food page entry to their growing database of more than 13,000 unique and extraordinary things to see and do (e.g., historical site, natural wonder). Highlight and promote your hidden gem(s) among a passionate, socially engaged community of adventurous explorers looking for their next travel destination. Visit North Carolina is excited to continue its partnership with Madden Media to offer the paid search co-op program, increasing exposure and driving traffic to partner sites by serving text-based ads next to search results on Google. With this co-op offering, each individual partner program will be managed by Google-certified experts who use geo-qualified keywords unique to the destination to serve paid search ads to relevant users. Tailored with specific calls-to-action, users will be driven directly to the most appropriate content on the partner website. 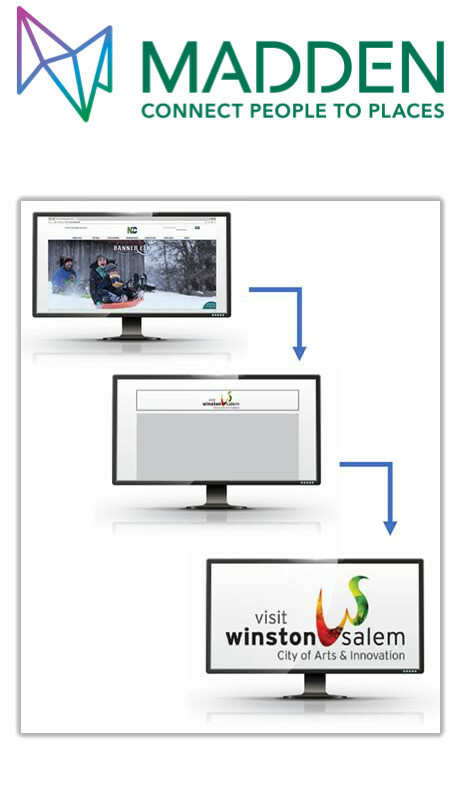 Visit North Carolina and Madden Media will again be offering this exclusive retargeting program based on VisitNC.com’s audience data. This is a truly unique offering that is not available through any other property. 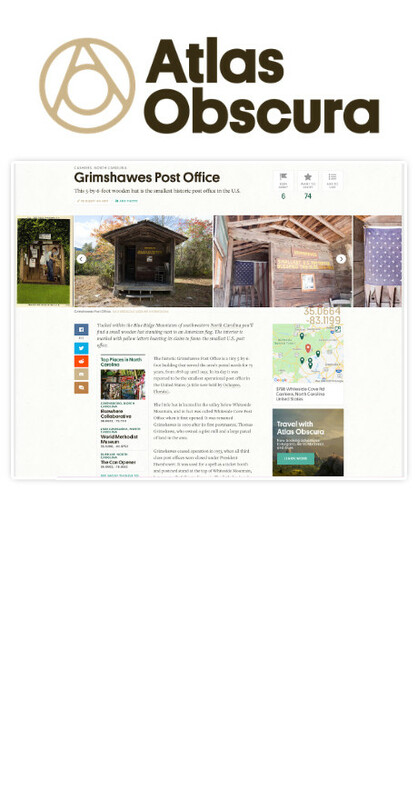 With this program, partners can take advantage of VisitNC.com’s vast site traffic and reach prospective travelers who have expressed interest in North Carolina. After users visit VisitNC.com, they will be served and targeted across the web with partner-specific display ads that include strong calls-to-action and drive to the respective partner site. 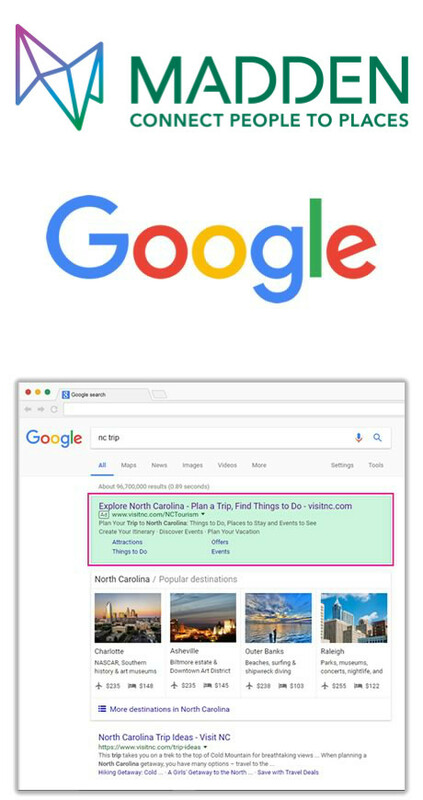 Through this new program with Miles Partnership, North Carolina DMOs can now benefit from customized support services surrounding the Google DMO Partnership Program to improve the quality and visibility of North Carolina destination-related content within Google’s search and travel planning products. If you have questions or would like to participate in the Google DMO Partnership Program Support Services, please reach out to Kim Palmer, kim.palmer@milespartnership.com.